Sharks, like other fish, use their gills to breathe. Water flows through the gills and out the gill slits while the gill filaments extract oxygen from the water. The oxygen is absorbed by the blood that flows through the gill filaments. Gill rakers, cartilaginous projections on the gill support structure, protect the delicate gill filaments from particles in the water that might damage them. The flow of water through the gills is essential for sharks to breathe, otherwise they will die of lack of oxygen – drowning. There are a couple of methods that sharks use to keep water flowing through their gills. The oldest method, that was also used by the ancestors of our modern sharks, is buccal pumping. Buccal, or cheek, muscles pull water into the mouth and over the gills. This way the shark doesn’t have to swim to keep water moving over the gills. Many shark species still use buccal pumping, such as nurse, angel and carpet sharks. Skates and rays also breathe this way. However, skates and rays, as well as some shark species are flattened and when they lay on the ocean floor they can’t pull water in through their mouth. These species have a more prominent spiracle, a tube behind the eyes that pulls water into the gills and out of the gill slits. Insects also have spiracles on their external skeleton that they use for breathing. The second method is called ram ventilation. Used my more active sharks, they are ‘ramming’ water over their gills while they are swimming. Most sharks can alternate between buccal pumping and ram ventilation. When they start swimming fast enough to force the water in more quickly than they could pump it, then they stop pumping. The sand tiger shark is an example of a shark that switches back and forth. Some sharks, however, have completely lost the ability to breathe by buccal pumping, and these are the sharks that will indeed drown if they stop swimming and ramming water. These sharks are known as obligate ram ventilators. 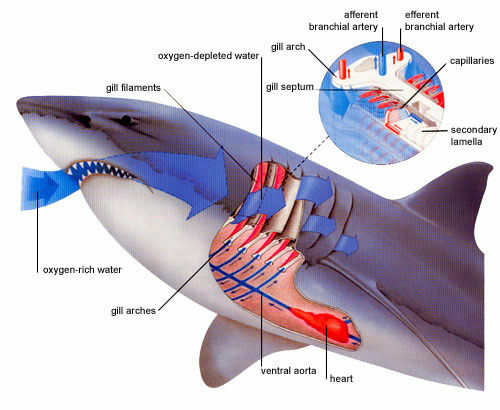 The great white shark, the mako shark, the salmon shark and the whale shark are all obligate ram ventilators. This is why catching these sharks for their fins and then throwing them back is incredibly cruel, as they will sink to the ocean floor and slowly drown.